3092, HUBCAP USED, 13", 80-84, CHEVY, CITATION, CHROME, 12 SLOT TYPE, SPARKLE GRAY POCKETS, CHROME RING & CENTER WITH RAISED GOLD BOW TIE, 4 SETS OF 3 METAL CLIPS. 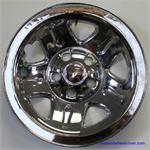 3138e, Used Rims 15X7, 5 LUG, 4-1/2", 96 - '97, FORD, EXPLORER, Chrome SKINNED 5 SPOKE. FITS 4X2 ONLY 4X4 TAKE 2-3/4" CENTER. 3318, Used Rims, 16X7, 5 LUG, 4-1/2", 98-02, Lincoln, Town car. Chrome cover alum, 8 PAIRS OF TRIANGLE SHAPED POCKETS. 3576, Used Rims, 17x7-1/2, 6 LUG, 135MM, 04-'08, Ford, F150, 5 SPOKE, CHROME CLAD. 3673, Used Rims, 18X7-1/2, 5 LUG, 4-1/2, 07-09, FORD, EDGE, 10 SPOKE, CHROME CLAD, TPMS, ALLOY. 6565, Used Rims, 17X6-1/2, 5 LUG, 04, PONTIAC, GRAND PRIX. 5 TWISTED SPOKE CHROME ALUM. 6588, USED RIM, 16X6-1/2, 5 LUG, 115MM, 05-08, PONT, GRAND PRIX, ALUM, CHROME SKIN, 5 SPOKE, ALSO COMES POLISHED & PAINTED SILVER.